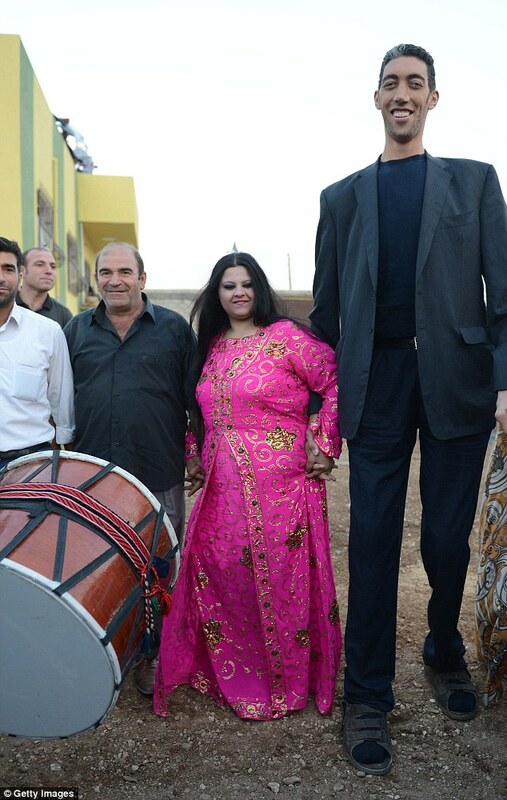 As the worldâ€™s tallest man, 8ft 3in Sultan Kosen despaired of finding a soulmate who would prove a perfect fit. 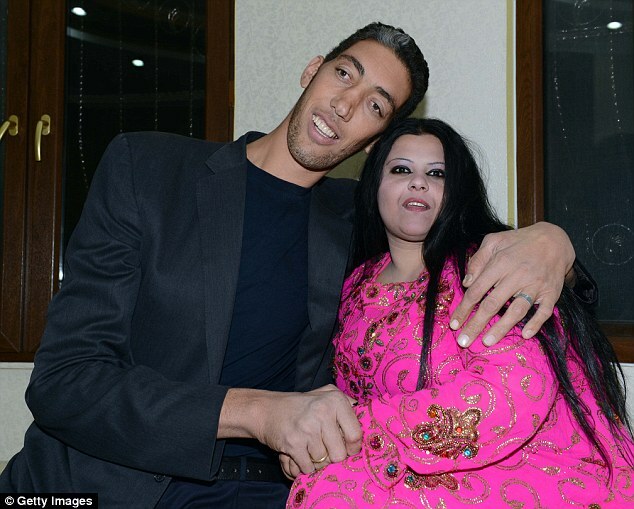 So the gentle giant says itâ€™s nothing short of a miracle that he has met his love match in Merve Dibo. 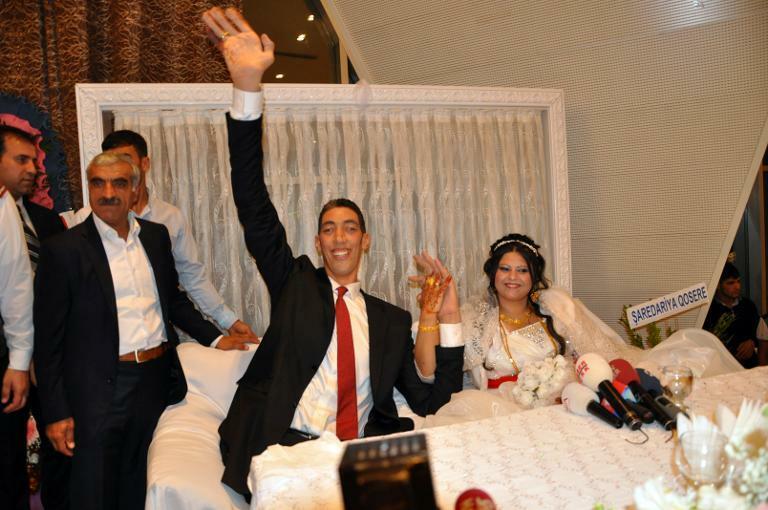 And despite a height difference of 2ft 7in, Mr Kosen, 30, celebrated the biggest day of his life yesterday â€“ tying the knot with his 20-year-old bride in his native Turkey. Before meeting Miss Dibo, Mr Kosen had spoken of his difficulties in finding a partner, as most potential girlfriends were put off by his size. But yesterday the part-time farmer, who had ordered a custom-made suit and size 28 shoes for his wedding, said he was thrilled to have found â€˜the person for meâ€™. Mr Kosen, who is one of only ten people ever to top 8ft, suffers from a rare disorder called pituitary gigantism, which causes his body to continually produce growth hormones.. 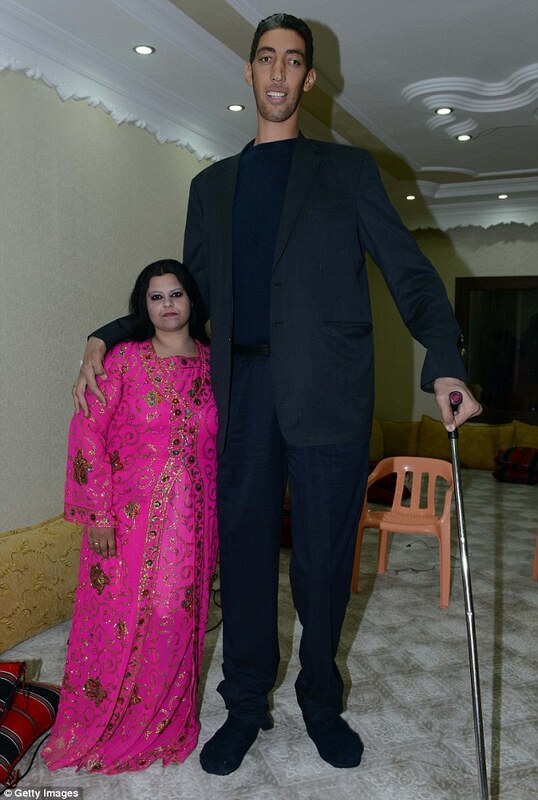 He began shooting up at the age of ten, became the tallest man in the world in 2009 and finally stopped growing in 2011. The all-time record holder was Robert Wadlow from Illinois, who died in 1940 measuring just over 8ft 11in. kadako sa iyang kamot nga managpa, paigo gyod tawon ang tibook nawong sa babaye, tsk, tsk, tsk. better be a reticent wife. hmmm, the question is: can she handle the kuan ? gigantism is an abnormal high amounts of growth hormone that makes every part of the body extra large. including genitalia. sigoro hilig ning bajeha sa dako'g kuan. ahihihihi! aw kuawa pod da!